The 'Smile Like You Mean It' rockers will be joined by Tears For Fears - who will perform for the first time in 12 years in London when the play the music extravaganza - Elbow and White Lies at London's Hyde Park on Saturday July 8. Brandon Flowers' band are the final headliners following in the footsteps of Phil Collins, Green Day, Justin Bieber, Kings Of Leon and Tom Petty & The Heartbreakers. 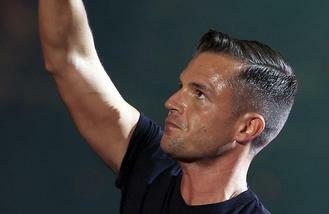 James King, AEG Live's Senior Vice President, said: "London has always seen The Killers as one of their own and the city has played host to many many memorable concerts. To have them back in the Park with such strong support from Elbow and then the first appearance in London by Tears for Fears in 12 years makes this a truly spectacular event for their fans on what will be a glorious return to Hyde Park." Fans desperate to see the American rockers can pick up exclusive pre-sale access from 9am on Monday (23.01.17). Daniel Mathieson, Head of Experiential Marketing and Partnerships for Barclaycard, said: "We're looking forward to seeing The Killers perform at Barclaycard presents British Summer Time Hyde Park this summer. Heralding from the party capital of Las Vegas, the band are sure to put on a great show for their fans! Tickets go on general sale on January 27 but Barclaycard customers can beat the rush with exclusive pre-sale access from 9am on 23rd January." Fans could be in for a full-on rock experience as the 'Somebody Told Me' hitmakers recently teased that their new album is is "heavier" than their previous work. Brandon gave a much-needed update on the progress of their follow-up to 2012's 'Battle Born', although they've assured die-hard fans that the lyrical content is similar to their usual subject matter. Brandon, 35, said: "There are moments that feel heavier than anything we've ever done, not that we're the heaviest band in the world, but they have a finesse because of our experience.